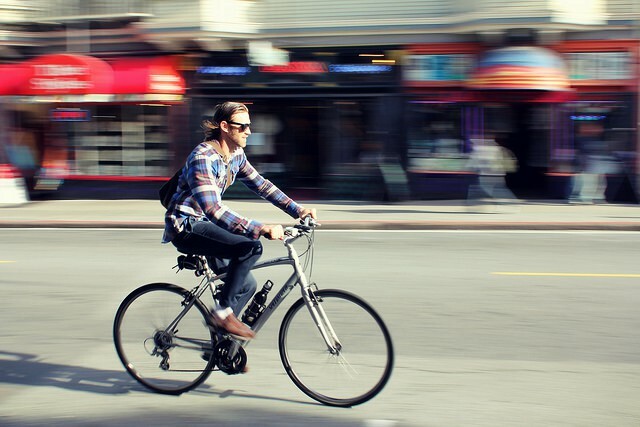 If you're a guy that wants to use your bike for getting around town, with the occasional bit of recreational riding at the weekend, then a hybrid could be the bike for you. They're affordable and come in gender specific options. 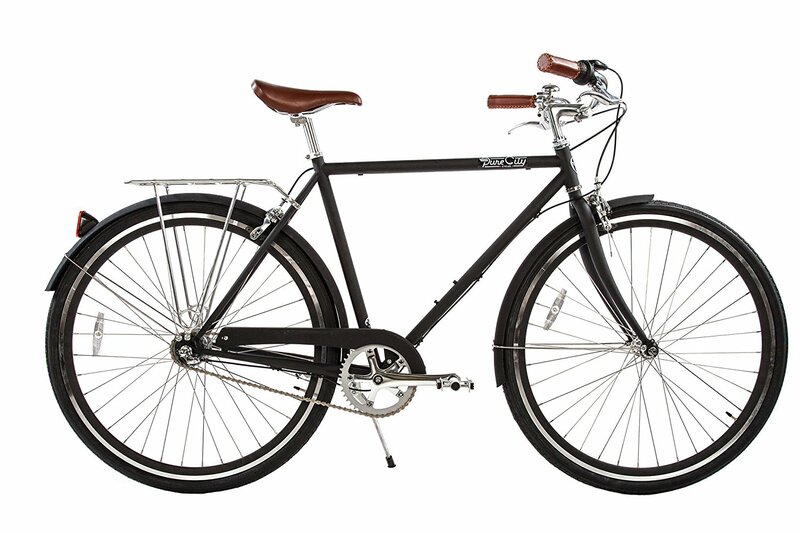 In fact, this guide includes the best hybrid bikes for men under $500. If I had to pick one right now, I'd go for the Schwinn Discover. It's got loads of additional extras at a reasonable price. What's not to like! Don't Have Time To Read? Check Out My Top Picks﻿﻿. Disclaimer: The bikes reviewed here are from the Amazon store only. There’re also many bikes worth taking a look at from online sites such as Competitive Cyclist, Pro Bike Kit & Wiggle. The hybrid sounds like a jack of all trades, master of none kinda guy. Road - Hybrids borrow the smooth tires and lightweight frames from road bikes. Tour - Just like touring bikes they have places to mount racks and bags to transport belongings. Mountain - They also use straight handlebars and an upright seating position like a mountain bike. And you'd be right. The hybrid won't be riding the Tour de ﻿﻿﻿Franc﻿﻿﻿e﻿﻿﻿﻿﻿﻿﻿﻿﻿﻿﻿﻿﻿﻿﻿ or cycling﻿﻿﻿ around the world anytime soon. However, a hybrid will see you through your morning commute or across a park with your kids. Something that would cause a terrain specific bike to struggle. 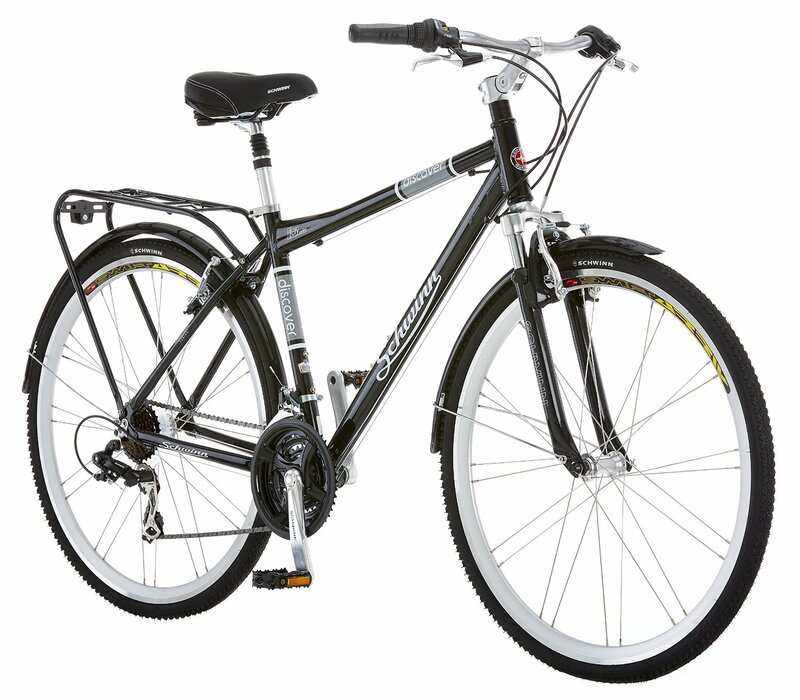 Below is great video guide by wheelies on the types of hybrid bikes available on the market. The best hybrid for your friend will not be the best hybrid for you. Think about the type of riding you'll be doing. Then decide if you want a hybrid that's more like a road bike, or more like a mountain bike. 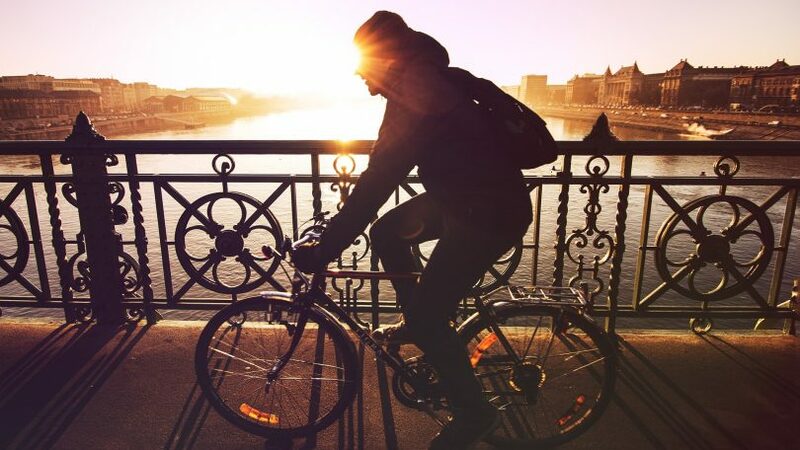 Most of your riding on roads and cycle paths? Recommendations include a road style hybrid. Slick tires enable fast speeds, and a flat bar handlebar provides a solution to road bikes limited visibility. Carrying lots of kits (gym gear, laptop, work clothes)? Buy a hybrid that comes with racks attached, or make sure it comes with eyelets in the frame. Eyelets in the frame allow you to fix racks yourself, but they'll be at an additional cost. Adapter clips can be used to fit a rack on a bike without eyelets. But, a frame specifically designed for the purpose is much better. And if the roads you're traveling on are a little dodgy, (think cobbled roads or a single track). You might want to consider a hybrid that has acquired some front suspension from its mountain biking brother. These bikes will usually come with slightly wider tires and a little more tred, for extra grip. You may also see the use of disc brakes, they're heavier but offer better braking power and are more consistent in wet and dry conditions. Whatever you choose it's important to pick a hybrid that's right for you and your cycling conditions. Related: Bike Size Chart: Want A Bike That Fits Like A Glove? 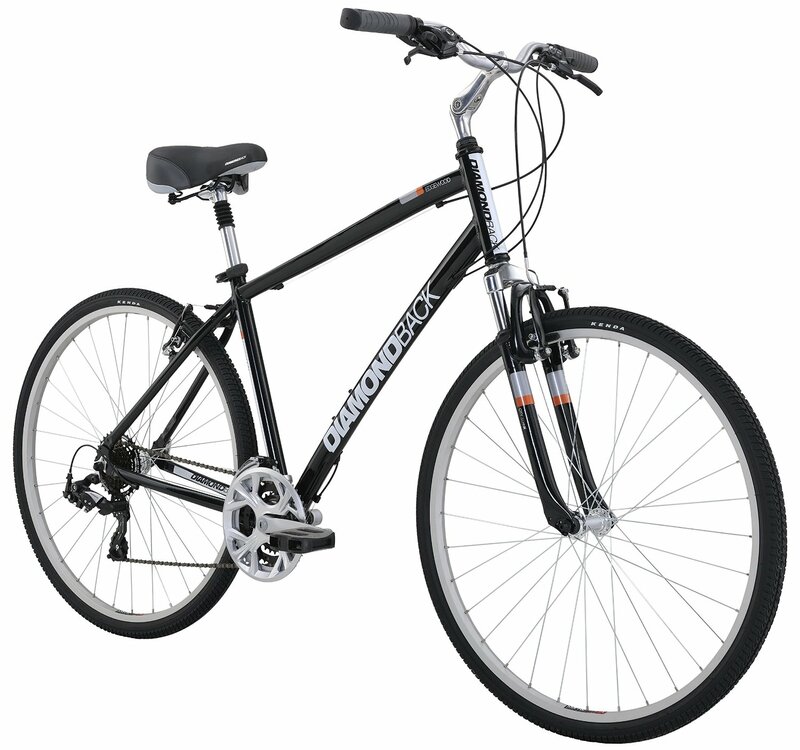 This Schwinn Discover is one of the most raved about hybrids for those on a lower budget. With the rack already fitted for carrying your stuff, it'll be quicker to get ready than you. Its classic look that will go with pretty much any style you’re wearing for that day, city riding is this frames specialty. The classic look combined with front suspension forks take the sting out of any potholes you accidentally hit. The fenders are a nice touch as they’ll keep the morning drizzle off your jeans. 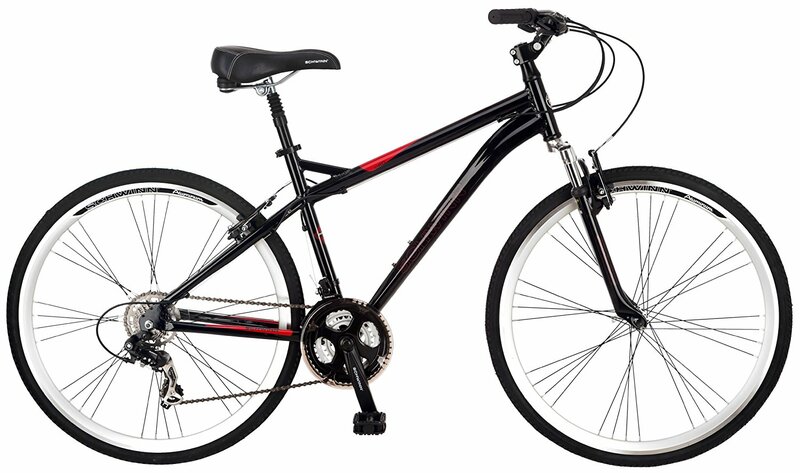 The bike comes with 21-speed twist shifters for comfortable gear changing, and alloy linear pull brakes. It comes with a pre-fitted rack. 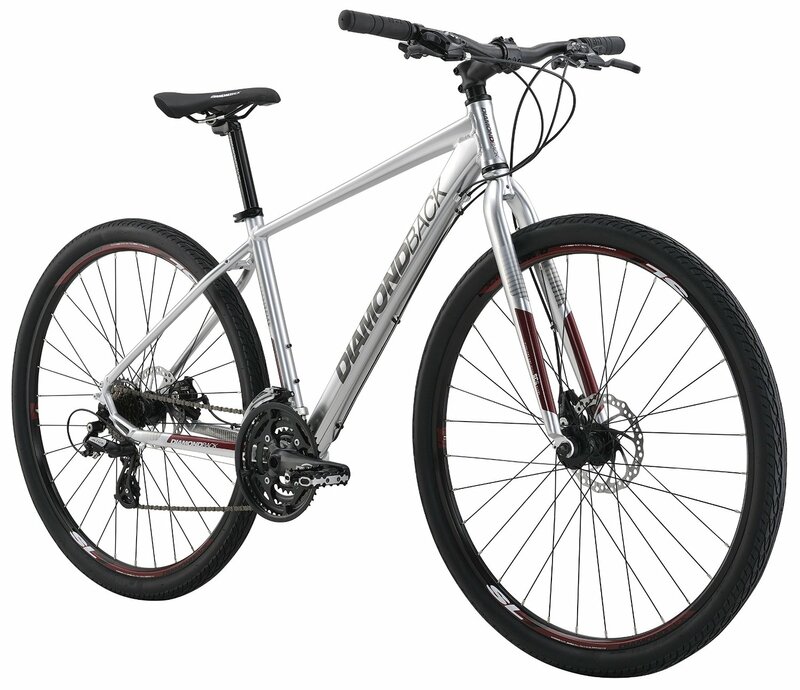 ​An all terrain, the Diamondback Trace is a bit of a beast. It has an aluminum alloy frame, forged dropouts, and high-tensile steel forks. This gives the bike more control and steering power. Making it easier to weave in and out of traffic or down your favorite single track. The Trace features a "dual-sport" frame design and leans more towards the feel of a mountain bike. Additionally, it's fitted with Tektro disc brakes, offering instant stopping power that are consistent in various weather conditions. Something to think about if you find traditional V-brakes let you down. The Trace is fitted with Shimano components, meaning you can count on high-quality components that take less maintenance. The 21-speeds provided will be able to take you over the biggest of hills. 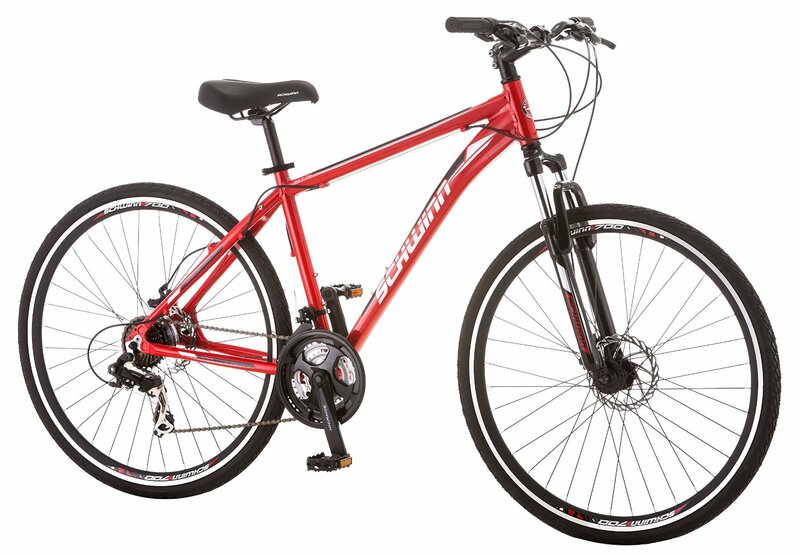 A comfort hybrid and another great bike by Schwinn, if you're not sure of the right type of bike for you, why not get a bike that can do it all? The Siro has comfort features built in like the front suspension and a spring seat post that will take the shock out of bumps in your way. The also has an adjustable stem at the front. An adjustable stem is a valuable bonus; it means that you can set the stem up correctly without the use of tools. You could even do it mid ride if it needed an extra tweak. This model is fitted with 21-speed EZ-Fire shifters and Shimano rear derailleur. As with all Schwinn models, you'll be backed by a limited lifetime warranty for as long as you own the bike. No additional rear rack or fenders. This is the best hybrid bike for men under $500. The additional accessories, good brand reputation, and classic style were enough to sway me and declare it as the overall winner.